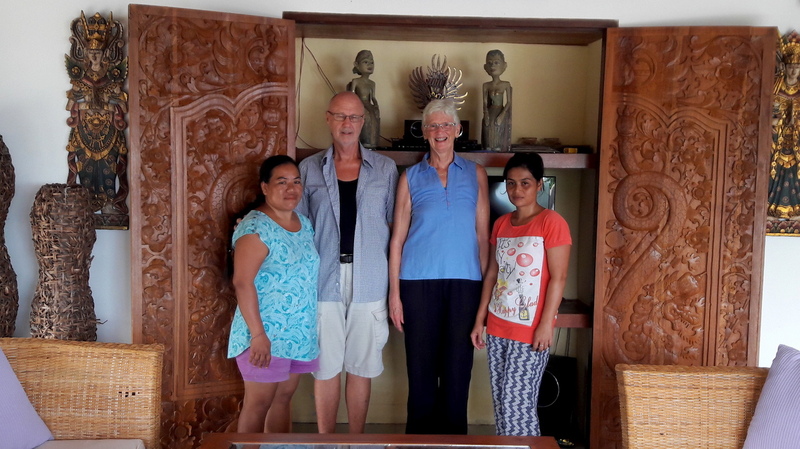 We came back to Bali on 9 May and have mostly been in Lovina watching and a bit helping get our new home, Villa Cengkeh, finished. We are scheduled to move in on 22 May. thought that it was nearby Villa Cengkeh, but as Airbnb does not show the correct locations for their rentals (to provide privacy for owners, I suppose) we were somewhat mislead about its location. It was "over" Villa Cengkeh. Almost literally. For a crow it was not far to fly, but a serious climb up the mountain on a poorly maintained road. While the views were superb, the trip up and down was such that we kept it to no more than one per day. On the other hand, the housekeeping was excellent and Putu (shown above) cooked dinner for us 5 nights per week. Her preparation and presentation was excellent. Last Thursday we moved down to Villa Kayu Putih which is only a 10 minute walk from Villa Cengkeh. We found it by simply stopping in one morning and speaking to the staff. The owner is normally here for the six winter months and had already returned to Holland and the villa was available for 17 days, so here we are. The house is very nice and the two staff here are also excellent and live nearby, so they will be some of our new neighbors. Susan has decided that she needs more cooking experience, so she is making all our meals here. YUM! Note: Villa Kayu Putih can be rented online via Micazu.